Available in a 1-day, 2-week, or monthly lens. 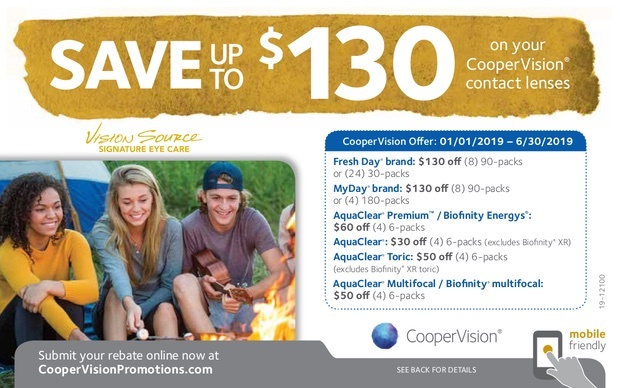 Schedule your annual eye exam with your Vision Source® optometrist to find out if a silicone hydrogel contact lens might be the right choice for your lifestyle. Aqua Clear® allows you to wear the lenses for up to 6 nights and 7 days. Thanks to our exclusive Aquaform® Technology, Biofinity® lenses allow plenty of oxygen to pass through to your eyes. Many enjoy the convenience of a daily disposable lens like Fresh Day®. There's no cleaning or maintenance, simply toss away on a daily basis. My Day® is the latest in silicone hydrogel technology offering even less awareness of the lens. The MyDay lens is wonderfully soft - softer than other silicone hydrogel, daily disposable lenses - yet they're easy to insert and remove. After purchasing your Aqua Clear®, Biofinity®, Fresh Day®, or MyDay® contact lenses from a participating Vision Source® optometrist, download this rebate and follow the instructions to either receive a Visa® Prepaid Card or to donate a portion of your rebate savings to Optometry Giving Sight, an organization dedicated to providing sight to millions of people around the world. See rebate for details. *We close M-F from 1pm - 2pm for lunch. Copyright © 2019 Bidwell Optometry. All rights reserved.